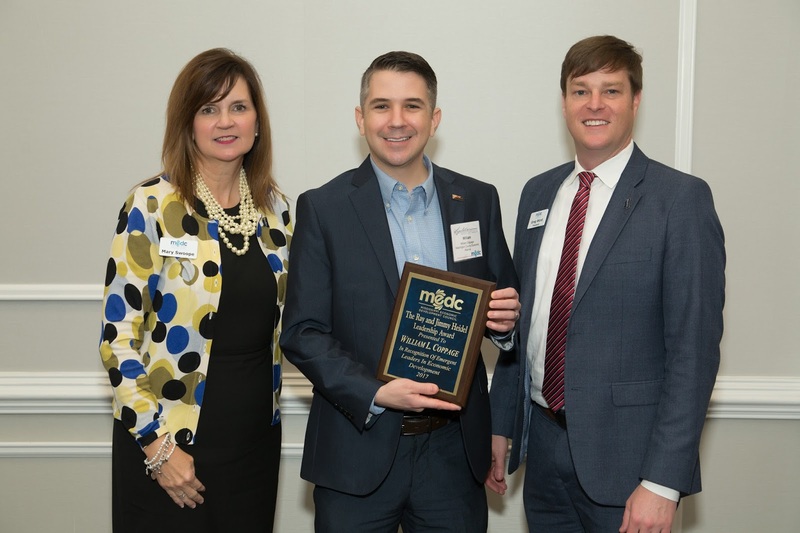 Washington County, MS – The Mississippi Economic Development Council (MEDC) announced that William L. Coppage won the 2017 Ray and Jimmy Heidel Economic Development Leadership Award on February 2, 2017. The Ray Heidel Leadership Award was established in 1995 by the Mississippi Economic Development Council to honor the life and contributions to the profession by Ray Heidel. In 1999 the name was changed to The Ray and Jimmy Heidel Economic Development Leadership Award to recognize Jimmy Heidel’s contributions to the profession on both the local and statewide levels. The Jimmy & Ray Heidel Economic Development Leadership Award is presented during True South Basic Economic Development Course at the University of Southern MS. The purpose of the award is to foster further economic development practitioner leadership skills. William Lusk Coppage, a native of Greenville, MS, serves as the Economic Development Project Manager with the Washington County Economic Alliance (WCEA). As the Project Manager, Coppage assists the Executive Director, Cary Karlson, on various economic development projects including business retention and attraction, as well as being responsible for online communications and ongoing data collection. Prior to joining the WCEA, Coppage held the position of Executive Assistant to the Mayor with the City of Greenville. He served in the United States Air Force as a Crew Chief on a Boeing KC-135 Stratotanker. Coppage is a multi-instrumentalist singer/songwriter. He has also numerous poetry and prose publications including in the Oxford American and Greensboro Review. His 2012 collection, Fantasies of Men won the 2012 Main Street Rag Chapbook Contest. Coppage graduated from the University of North Carolina in Wilmington, NC with a Bachelor of Fine Arts and has both a Master of Fine Arts and a Master of Arts from McNeese State University in Lake Charles, LA. Coppage and his wife Missy (Gymnastics Program Director & Head Coach at The Hodding Carter Memorial YMCA) reside in Greenville with their daughter, Lyla Jane, and two pound puppies, Jolene and Townes.